Editor's Note: This article originally appeared on Bond Street. If someone were to say the phrase “urban agriculture,” quaint community gardens would probably come to mind. A vital resource, especially in major metropolises like New York and Chicago, these gardens usually contain a row of tomatoes, perhaps some other vegetables, and much needed green space—respite from the concrete jungle. In 2008, longtime friends Viraj Puri and Eric Haley, who were both working and living in NYC, started talking about starting a green business together. They had the idea of building greenhouses in cities, and their idea took off in a serious way. Today, Gotham Greens is “a global pioneer in the field of urban agriculture and a leading regional producer of local vegetables and herbs,” as stated by the office of New York Gov. Andrew Cuomo, who assisted the opening of their 60,000-square-foot space in Queens in 2015. This is big, even compared to the 15,000 square feet of their first greenhouse in Greenpoint, Brooklyn, which they opened above a bowling alley. Besides scale, what’s big about this idea is the commitment to green agriculture: the millions of pounds of fresh produce are grown pesticide free, using renewable energy. And of course, the carbon footprint from transportation is nil compared to shipping food from farms across the U.S. and world. Looking to revolutionize the concept of urban agriculture, Vaj Puri and Eric Haley, along with their third partner Jenn Nelkin Frymark, have developed a model of urban agriculture that’s changing not only how we think of farming, but of our cities too. Below, Puri and Haley talk about how they started Gotham Greens, the challenges of such an ambitious idea, and their favorite vegetable. Bond Street: What’s the origin story of Gotham Greens? What led to its founding? Viraj Puri: We were inspired by innovation and technology, and driven by a sense of duty to address ecological issues facing our agricultural system. It was winter in NYC and we realized that most of the produce we were finding in the supermarkets was coming from places like Mexico, California, and Israel. We realized that by the time the produce made its way here, it was at least a week old and had changed hands multiple times. We also began to notice that consumer preferences were shifting toward more local and sustainably produced food. We wanted to create a sustainable farming company that could revolutionize the notion of how fresh local produce can be grown and distributed, while making a profound positive impact on inner city communities and the environment. It was exhilarating and humbling at the same time. Bond Street: How did you first attempt this? VP: It was late 2008 and both Eric and I were living and working in New York; I was working at an environmental engineering firm and Eric at a private equity and advisory firm. We had been friends for years and were interested in starting a cool green business that could have a big impact. We were both interested in food, agriculture, clean energy, and green building, so we researched the enormous impact that conventional agriculture had on the natural world in terms of resource consumption and pollution. I had exposure to hydroponic greenhouses and it seemed like a great technology to bring into cities. So we wrote a business plan and decided to embark on a journey: together with our third partner, Jenn Nelkin Frymark, we built our flagship greenhouse, the first commercial scale rooftop greenhouse in the United States, in 2011. Bond Street: That’s in Greenpoint, Brooklyn, right? VP: It’s a state of the art greenhouse facility in Greenpoint. We feel it represented a shift in the concept of urban farming from a seasonal community gardening resource, to a year-round, viable, commercial scale farming enterprise. Eight years later, we have four greenhouses across two cities and over 140 employees. Bond Street: Give me an idea of the basic structure of Gotham Greens—what’s the model of urban agriculture that you’ve developed? VP: Simply put, we grow premium quality local produce in high tech, climate controlled greenhouses, year round. That means, even in the dead of winter, we provide our customers— supermarkets, restaurants, caterers—with fresh produce within a couple of hours of harvest. Our pesticide-free produce is grown using ecologically sustainable methods in 100% clean, electricity-powered urban rooftop greenhouses. We use advanced, re-circulating hydroponic techniques to maintain precision plant nutrition. Hydroponic farming, when practiced effectively, can be very efficient, using a fraction of the amount of resources as traditional farming practices. This enables us to use 1/10th the amount of water as traditional soil based practices, while also eliminating all agricultural runoff. Bond Street: This level of efficiency must help both the environmental impact and your bottom line. VP: Another major aspect of our model is the productivity: our advanced growing methods yield 20-30 times more product per acre than field production, while eliminating any use of arable land. Our 170,000 square feet of greenhouses across the four facilities produce yields equivalent to over 100 acres of conventional field farming. 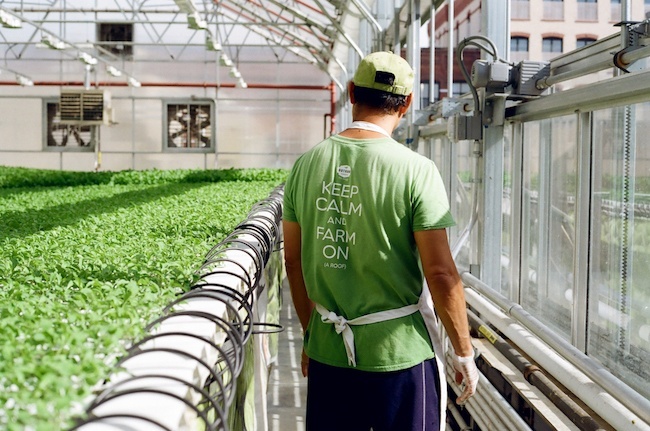 This makes us the largest urban agriculture company in the world. Bond Street: What was the biggest business challenge at the time of starting up? Eric Haley: Starting any business is extremely challenging, but for most businesses, there are at least a couple of models to use as a point of reference. In 2011 when we were designing our flagship Brooklyn greenhouse, there was no blueprint to follow, so we had to learn as we went along. There was no precedent for what we were trying to pull off. People thought we were crazy when we told them we wanted to build large-scale greenhouses on city roofs. We initially faced some setbacks, challenges we faced included finding the right real estate and landlord. Logistics, regulatory challenges (zoning, permitting, etc. ), and high upfront costs were probably our biggest challenges. Bond Street: What was the most important lesson that you learned during that time? EH: Perseverance goes a long way. Keep trucking no matter the setbacks you face. Wearing many hats is part and parcel of starting a business, but you can’t be afraid to delegate and grow your team early on. Bond Street: Walk me through the Greenpoint greenhouse. VP: Our Greenpoint greenhouse measures over 15,000 square feet and annually produces over 100,000 pounds of fresh leafy greens. The greenhouse remains one of the most high profile contemporary urban agriculture projects worldwide. Designed and built with sustainability at the forefront, the facilities’ electrical demands are offset by 60 kW of on site solar PV panels with high efficiency design features, including LED lighting, advanced glazing, passive ventilation, and thermal curtains. Rooftop integration further reduces energy use while serving to insulate the historic Greenpoint Wood Exchange building, which once housed a bowling alley, below. Bond Street: When did Whole Foods come on as a client? VP: Shortly after launching our first greenhouse, we had attracted retail customers such as Whole Foods Market and notable restaurants such as Gramercy Tavern, so we knew that we were on to something. Whole Foods Market has been one of our early supporters and customers since day one. They approached us with the idea of building a greenhouse on top of their flagship Brooklyn store in Gowanus; it measures over 20,000 square feet and grows over 200,000 pounds of fresh greens and herbs each year, much of which are sold in the store downstairs. This project represents the first commercial scale greenhouse farm integrated into a supermarket. Bond Street: Seems like a simple supply chain. VP: We harvest our produce every day and bring it right downstairs through the elevator to the store below. We are literally converting food miles into food footsteps! Bond Street: Tell me about the greenhouse in Chicago. VP: In 2015, we opened our largest and most technologically advanced greenhouse in the Pullman neighborhood of Chicago’s south side. It’s over 75,000 square feet and annually grows up to 10 million heads of leafy greens and herbs, year-round. Spanning nearly two acres, the climate controlled facility is located on the second floor rooftop of Method Products manufacturing plant. We think the unique partnership between Gotham Greens and Method Products is a groundbreaking vision for a 21st century manufacturing facility. Method’s factory, designed by William McDonough + Partners, is the world’s first LEED-Platinum certified manufacturing plant in its industry. Bond Street: What’s your best selling product? Any differences across markets? EH: Our most popular products vary between markets but typical crowd pleasers are our Butterhead lettuce, Gourmet Lettuce Medley, and Arugula. Our Genovese Basil is a hit too. We grow a similar offering of products between NYC and Chicago, though we’ve got some special local ones. We’ve also customized the names to be locally relevant; for example our Blooming Brooklyn Crunch lettuce is known as Windy City Crunch in Chicago. Bond Street: What are each of your favorite vegetables? EH: Roasted vegetables. Any of them. All of them. VP: Leafy greens. Any of them—all of them! If I had to pick one, I would say arugula. Bond Street: How do you measure your environmental impact? VP: We measure our environmental impact through a lot of monitoring and data collection of our growing and distribution process. According to our measurements, we use ten times less water than conventional farming while producing almost thirty times the yield. We use renewable sources of electricity and by delivering hyper-locally, we’re reducing food waste and the need for long distance trucking, and giving customers a fresher, better tasting and more nutritious product. We harvest our products every morning so they can be on retail shelves by lunch. Bond Street: Do you have plans to open more facilities? Anything in the works that you can share? VP: Our goal is to bring our brand of premium quality, sustainably grown local produce and innovative greenhouses to more cities across the country. Stay tuned! Bond Street: What sort of marketing program does Gotham Greens employ? EH: We partner with a variety of great organizations in NYC and Chicago, from non-profits to other local food producers and chefs. We’re also active on social media and use that as a way to provide information, connect with consumers, and show people a look at daily life on our farms. In our cities, consumers are increasingly concerned about where their food comes from and the environmental and public health issues surrounding conventional agriculture. It’s a platform that allows our customers to contact us easily and provide feedback, as well as ask questions about our sustainable farming practices. Maintaining an open line of communication helps us understand what consumers care about, and helps us foster ties with our local communities. Bond Street: What does Gotham Green’s distribution network look like? How far do you ship, and how do you get it there fast? VP: Long distance transport associated with trucking food across the country and the food waste that results from it are significant issues. An estimated 25–40% of food grown, processed and transported in the US gets thrown out before it even reaches our plates! At Gotham Greens we attempt to address these issues on a daily basis. Every day we harvest, pack and deliver our products within 24 hours of harvest with our fleet of trucks to ensure that our products are reaching the shelves and plates quickly. Bond Street: Who are some of your customers, and how did you develop these relationships? EH: Whole Foods Market has been an incredible partner. Back in 2011, they were one of our first customers and really support our mission of growing locally and sustainably. Building our second greenhouse on top of their flagship Brooklyn store was a really unique opportunity and we work closely with them to help tell that story to customers throughout their store. VP: We work with a variety of supermarkets, restaurants, and foodservice providers; groups and restaurants in New York Tri-State and Chicagoland/Midwest regions, including Whole Foods Market, Jewel Osco, Target, Fresh Direct, Peapod, Union Market, Gramercy Tavern, Gibsons, and many more. We’re adding new customers all the time. Bond Street: What’s the biggest business challenge that Gotham Greens currently faces? EH: The demand for our product continues to outstrip the production. Last year we opened 2 massive facilities and we’re continuing to scale up and have a bunch of projects underway, which we’re excited to launch early next year. We want to continue growing sustainably in terms of both our farming practices and our company culture. Bond Street: What, in your opinion, is the biggest environmental threat that the world currently faces? VP: Climate change is causing widespread disruptions to weather patterns and unpredictability overall. Impacts on food production could be significant. Particularly concerning is that it’s likely to lead to a loss of arable land, disrupting food and water supply within a broad belt extending north and south of the equator, which encompasses some of the world’s most populous regions. The good news is that as a response to these concerns, scientists, farmers, policy makers and entrepreneurs are bringing attention to the issues and pushing toward more sustainable forms of agriculture. Bond Street: How does one of your products address this issue directly? EH: One new product and initiative that we just launched is Ugly Greens. It’s an effort to bring some attention to the issue of food waste. Approximately half the food we grow in the U.S. is thrown away, much of it for cosmetic and supply chain reasons. We’ve taken our slightly bruised and blemished product and rather than send it for composting, we’re packaging and selling them at a discount. In our industry, consumers are increasingly concerned about the environmental and public health issues surrounding conventional agriculture including high resource use, food safety, pesticide use, long distance food transport, pollution, GMO’s and monoculture farming. We’re addressing each of those issues while providing economic development opportunities in our communities. Bond Street: What’s the 5-year vision for Gotham Greens? EH: To bring our model of urban farming to other cities in the U.S.
VP: "Endurance: Shackleton’s Incredible Voyage" by Alfred Lansing. Bond Street: What are your five favorite small businesses?